This trip is especially nice if you have a rental car, but can easily be done by bus too. If you take the toll road, drive north towards Cancun and take the Chichén Itzá /Merida/Valladolid exit to the cuota (toll) road. The toll is hefty, about $355 pesos (about $15 US), but the road is in very good shape, quiet and very fast. The highway number 180 D. The D is for dinero!) The drive will take about two hours. You will go through two toll booths and there may be an army check-point at Chichen Itza. If you take the free road, drive south towards Playa del Carmen on the lateral road beside the highway in Puerto Morelos. Turn right at the Ruta de Cenotes road. This good road will take you all the way to Leona Vicario, where you will join the main free highway to Valladolid/Merida/Chichen Itza. Slow down when you approach any town, there are likely many speed bumps. The drive will take about two and a half hours depending on traffic. Drive the speed limit and watch for traffic attempting to pass on the two-lane road. Note, if you take this road on the way back, there is only one sign marking the Puerto Morelos Corta (short cut). Do not miss this turn or you will end up in Cancun! As soon as you arrive at the site, head for the big pyramid (el Castillo) and see it before the crowds do. Update: Since 2007 you can no longer climb the big pyramid at Chichen Itza. It may be a temporary ban or a permanent one. Please note you still can climb the big pyramids at Coba and Ek Balam. Chichén Itzá opens at 8:00 am, try to be there before 9:00 at least. Going early allows you to see most of the area before it gets too hot (there is very little shade) and also lets you beat the majority of the huge tour buses from Cancun that spit out hundreds of noisy tourists out on the site by around noon. Take water if you can and wear a big silly hat to protect your head from the sun. 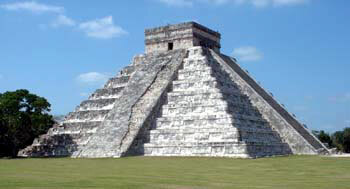 After you have finished at Chichén Itzá (usually 3-4 hours) take the libre (free) road to Valladolid. It’s a right turn as you exit the ruins. You will pass through many tiny Mayan villages. Take note of the round stick houses with hard packed dirt floors that are carefully swept every day. Often you can buy souvenirs or fruit along the roadside. Watch for topes (tope-ays), which are very large speed bumps. If you hit one at full speed, the undercarriage of your rental car will be neatly removed or you may be launched into space. Most topes are marked with signs, but there always seem to be a few wild cards, so be observant when approaching anything that looks like a town. A few blocks from downtown Valladolid is Zaci, an immense cenote. There is also a famous cenote called Dzitnup just outside of town that you can swim in. There is a small zoo outside it. (A map of the town is usually available at the tourist information office which is located right on the square.) Valladolid is the REAL Mexico. An old colonial town that is missed by most tourists. Head for the centro, which has a large public square surrounded by a couple of hotels and restaurants. Along one side of the square, a long row of Mayan women sell their wares, all wearing their immaculate white embroidered dresses. The ubiquitous Catholic church towers over the centro. We recommend having some lunch in Valladolid. If you are in the mood to see another Mayan archaeological site, visit Ek-Balam just north of Valladolid. This has only recently been excavated and features some stunning detailed work. Very few visitors mean you will likely get the whole place to yourself. It’s a favourite of ours for just that reason. After visiting the Ek Balam site, consider visiting the pueblo of Ek Balam. This is a tiny Mayan village which is home to Genesis Ek Balam, a retreat built by fellow Calgarian Lee Christie. You can stop here for a meal, a drink or a night. Lee has built an incredible facility that is designed to contribute to the preservation and appreciation of nature and the traditional lifestyle of the Maya. You’ll appreciate the relaxing surroundings and the beautiful gardens. Take the toll road (or free road if it is early) back to Puerto Morelos. Get fuel before you leave Valladolid. 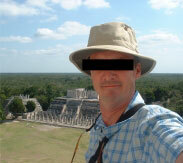 Bring sunscreen and wear a hat at Chichén Itzá. The sun is strong and the shade is scarce. We bring water too, though it is available at the gate. Wear good shoes. You will be doing plenty of walking and the steps on the pyramid are smooth, slippery and irregular. Admission to the Chichén Itzá site is around $232 pesos for adults and 10 pesos to park. For the latest admission prices, check this website. You can extend this daytrip by staying overnight in Valladolid or Ek Balam. 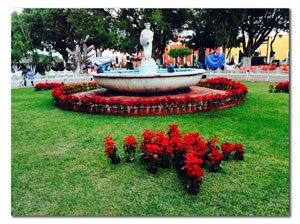 Hotels are inexpensive; in Valladolid we have stayed at Hotel San Clemente or Maria de la Luz. Either should be around $40 US. You can also stay at the Genesis Retreat in Ek Balam. Our friend Lee Christie has created a fantastic retreat with gardens and a natural pool. Check out her website here. Alma Libre Bookstore on the square in Puerto Morelos has current maps and guidebooks to help you get the most out of your trip. There are many destinations you can add to this trip.